A post today on Scamp about charity ads and his quote of copyranter's excellent take on the matter has got us thinking about this post we've been meaning to do for a while. A few years ago my cat went missing. After it had been missing for about a day it became clear that to help get it back, we needed to make some posters and flyers to get people looking out for him. Now, to put this into some context, I love my cat. A lot. And I wanted him back safe in one piece as soon as possible. So, to me, this was the most important piece of advertising I'd ever done. Looking back now, I applied every ounce of experience and ability to making the most effective poster I possibly could. I thought about who it was aimed at, what I wanted them to take out of it straight away, how I was going to catch their attention, how I was going to make them care, how to get them to act, what tools to give them to act. And how to do all of this in as pithy a way as possible, so a person going about their own business would get the message. And, just as importantly, I didn't employ any technique that would get in the way of the communication, or that would cloud the main point - only things that made the poster more effective. The poster I made wasn't a million miles away from these posters above, it wasn't particularly beautiful, it certainly wasn't a piece of art. But it was simple and compelling, and effective. Afterwards I thought about what would happen if you gave the brief of a lost cat poster to a typical creative department. If they applied the same methods to the poster as they do to their clients' communications, what would the end result be like? Would it be shot by an obscure Brazilian photographer they'd always wanted to work with? Would the main point be obscured by a joke, or by an obtuse idea that got in the way? Would the focus of the creatives be on the poster's absolute effectiveness? Or would they be obsessed with creating a poster that 'had never been done before', or that their peers would be impressed with? Would they have avoided using a picture of the cat because 'it's a bit of cliche innit'? I'll leave you to your own conclusions. But if they had to design a poster to get their own loved pet back, would they approach it differently? And that is the The Lost Cat Poster Theory. It's a reminder to everyone, and to creatives especially, that the use of creativity in advertising is there to increase the effectiveness of the communication, and for no other reason. Creativity is not there for its own sake, it is a means to an end. If a creative idea is getting in the way of the message, or is an unnecessary flourish, or muddies the point, or is confusing, then the person creating that advertising is letting their own ego get in the way of the job in hand. Here's the difference. Clients might think the motivating thing to do is write LOST CAT across the poster. That after all is what the poster is about. But they miss the point. The creative's solution might be to write the word REWARD as the largest word on the poster. Why? because that is what will motivate someone to read it. Thanks for your thoughts Anonymous 15:58. This is exactly what I'm talking about, you're applying your thinking to working out what would be the most compelling way to get the poster to work. That's proper advertising writing and art direction. Your start point is what will make it work better, not what will make you look clever or 'creative'. 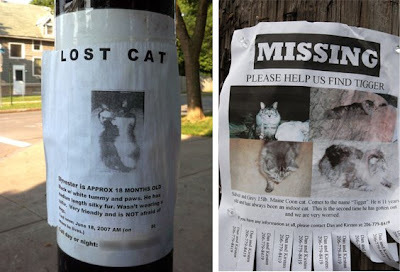 Only people to care about lost cats are people with cats themselves (especially if they've ever lost one). So i'm with the 'Lost Cat' line. I wouldn't look at the word 'reward' more than i would 'make an extra £1000 a month'. Like the idea of making things very simple - have long subscribed to this approach. Agencies out there - the longer the presentation / explanation / build up / theology to the idea takes, the more i'm sure the idea will be very average (i've done it myself). if it's really good - just put it up and talk about it. So inspiring, in fact, that I thought it would be fun to throw together a few comps of what some of these agency-produced Lost Cat Posters might look like. Hope these silly ads brings you a few giggles and a smile. If not, and you'd rather I didn't link to your blog, please just drop me an email to let me know. Thanks for the lovely comment and feedback TCCB. I enjoyed your post and the posters, cheers! Lost cats are old news, it's all about Pigeons these days. Love the blog, always makes me chuckle.